Grammy nominated Jai Uttal (2002 Mondo Rama) is a pioneer in the world of music community with his eclectic east meets west sound. 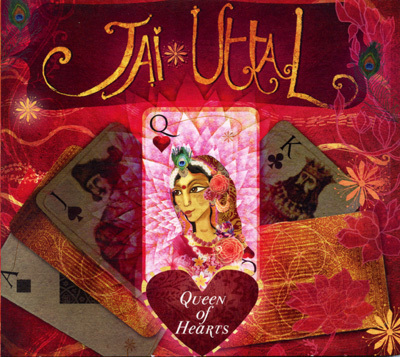 His newest album and eleventh studio release 'Queen of Hearts' is a unique mixture of reggae, ska, and samba rhythms, used as a backdrop for call and response, dance-oriented Kirtan, and invoking Queen Radha (Radharani), the bestower of devotion. About the sound, Jai says I went for the old school reggae and ska approach, rather then the dubby reggae that a lot of people are doing?.there is more guitar oriented chants but all the songs also have Indian percussion to bring the feel back home, so to speak. A horn section rounds things out nicely. I've always loved reggae and everything I do is sort of Indian....more and more my Kirtans have been reflecting the Vaishnava moods of devotion (Radha, Krishna, Gopala, Sita Ram, Hanuman). Recorded in California, the eight track album was written and produced by Uttal alongside his longtime collaborator Ben Leinbach. Jai will tour internationally this summer through the end of the year and adds World music is music from everywhere. Music that creates bridges. Music that unites hearts and cultures. Music that brings peace.